THE joint venture between Geosource of the United States, a seismic oil exploration company, and the Chinese oil industry has ended its first year of operation with both sides much the wiser. 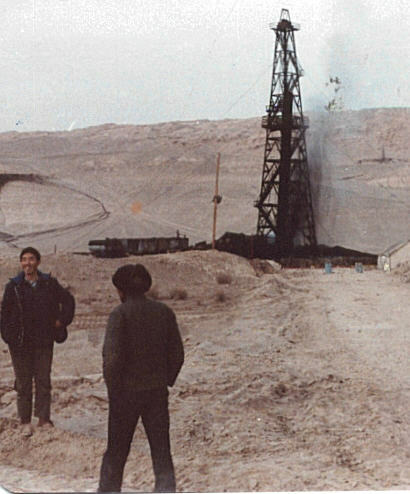 The three-year project is designed to introduce modern seismic techniques in the Qaidam Basin of northwest China. In view of China’s urgent need for oil to fulfill development goal, and the proven record of the US-based multinational, both partners had high hopes of success. The Chinese side hoped for about 10,000kms of geophysical across-section maps of possible oilfields, plus a massive transfer of operating, maintenance and repair technology, while Geosource anticipated close to a third profit on this investment and an edge have been serious shortfalls on all counts. As was later revealed, the QPC was not unanimously convinced of a need for much of the imported equipment nor the foreign specialists. The QPC seismic exploration unit, hoping to avoid “contamination” from the foreigners, set up a special group in a distant town to handle them. The QPC seismic exploration unit has four field crews, each of several hundred workers, using mainly domestically manufactured equipment (though the vital field electronics are made by a Geosource subsidiary).These local crews each log an average 20-50 kms a month except during winter when they close down. Geosource undertook to provide three field crews, each consisting of about nine foreign experts and several-million US dollars-worth of high-technology equipment and machinery to be matched with about 100 local workers. Each crew guarantees to produce more than 100 kms a month, with provisions for adjustments for abnormalities such as bad weather and strikes. The targets are generally being met, but with excessive depreciation of equipment and a parallel impact on the morale and health of project staff. Soon after 40 foreign technicians, mechanics and administrators assembled in Lenghu, west Qinghai, with their US$12 million-worth of vehicles, instruments and equipment, problems became apparent. Helicopter service was one of the earliest problems. After being told years ago by Geosource that helicopter support would be needed to explore the oil-rich Huatugou sedimentary range, the Chinese insisted on buying and operating their own aircraft. When the time came to put the field crew to work, the CAAC pilots and service personnel turned out to be completely outside the control of foreign and Chinese crew managers. They disobeyed reasonable instructions, took hours meals and on one occasion left Geosource and QPC personnel in the mountains overnight in below-freezing conditions because the pilot flew to a nearby town without permission. The Chinese Government lost several monthly US$250.000 free payments because of the helicopter snafu. Fortunately for the project, in October last year, after standing by for several months, the helicopter unit returned with a new leader and a new attitude – and has worked well since. Problems also arose as a result of false images the two sides have of one another. The Chinese expected a foreign expert to be a man of propriety consonant with his formal qualifications. They were not prepared to deal with a western seismic oilman and his penchant for nose-thumbing at bureaucracy and officials. The foreigners were equally ill-prepared for dealing with the Chinese. From the “rednecks” to the managerial types, they all expected labour on relations to be excellent, based on their experience with industrious Overseas Chinese and their image of the communist system as disciplined and honest. In a typical labour incident, a young and inexperienced but over-confident Chinese driver might climb into a new, expensive and complex drill vehicle and start doing something obviously wrong – say, bog it in sand then over-rev it and crash the gears. As yet there is no bonus system, nor any way to promote or fire workers. Labourers in the field receive about RMB 160 a month. This seems high compared with east coast wages, but in fact it is the same as salary received by colleagues working in the parent unit not involved with foreigners who work eight hours a day rather than 10, six days a week rather than seven, and rest for most of the winter months. Workers sent to work with Geosource are further from home, in rougher terrain and have a higher productivity. Team and crew leaders get the same as workers so there is little enthusiasm for responsibility. One progressive-minded QPC area manager agreed to a wage system structured on responsibility and productivity. Workers heard of the system and became excited. Two deadlines for starting the new system passed by. Finally the director of QPC, who is politically important enough to have attended the 12th party congress, came to the field and denounced the scheme as anti-socialist. Relations with the workers after that worsened. Geosource agreed to underwrite the resupply of spare parts which resulted in enormous costs, especially last winter when workers may have sabotaged equipment in order to stay indoors. Houston headquarters responded by sending in tougher managers to meet the Chinese head-on. The new rationale behind day-to-day operations is that there is no point in worrying about the next contract if money cannot be made on this one. In retrospect there was no easy way to find out the major problems without putting men and machines on the ground and getting fingers burnt. There are many clauses and operating procedures Geosource would now like to see in the contracts but they just did not occur to anyone until incidents actually occurred, ranging from a knifing and a handgun confrontation, to strikes, theft of foreigners’ belongings, equipment abuse, reckless use of dynamite, detonators and helicopters and drunkenness on the job. Until recently, the author worked as crew manager for Geosource’s Qinghai Project. I was a Surveyor / Party Manager / Utility on the Heli – dynamite crew. I have some Chinese clients in Canada, and I was trying to explain where our programs where, and I can’t remember much about their locations other than they were a long long drive from Lenghu. I read this article with interest, as that is pretty much the way that I remember things. Of course at the time I didn’t know the financial details in the background, but my dealings with the Helicopter pilots in regards to leaving people in the field caused some grief. I don’t remember much about who was on the crew, as there was a German party manager who left a couple of days after I arrived, Phil Riker and an English mechanic. Phil and I arrived with the Chef that was brought in from Singapore if that gives you some sort of time frame. I think that was 1982 or 83. I have been looking on Google earth, and it looks like the area I think we were in has been developed and it looks like many paved roads in the area now. I was wondering if you had any info on the areas that the crew worked I would be interested in seeing where we were. I visited the Vibe crew on the way to my crew. I remember as that is where the police showed up to deal with a grader operator or truck driver that assaulted a woman in one of the road houses. Any info would be appreciated, as when you’re young you never think you’ll forget these things. I have lots of photos and slides that I’m digitizing, so I would like to put some locations and stories to them.